Half time and it’s 25-8 to Ireland. That familiar vibe of optimism was felt in the local pub’s atmosphere. Many were getting ready for history to be made. “I think we’re going to do it” was overheard, likewise however was, “it’s going to be 2013 all over again.” I was inclined to agree with the whispered latter. In my mind it wasn’t just going to be 2013 all over again but basically any All Blacks game I had watched all Summer – all over again. I had refused to cheer in the first half and maintained that Ireland would have to improve by 20% in the second half to have any chance. Feeling smug throughout, perhaps trying to mentally justify the early alarm clocks I had set for the Rugby Championship and preparing for the seemingly inevitable bitter taste of defeat; I probably spoiled the match for myself by keeping emotions to a mute – or at least up until Robbie Henshaw crashed over with 75 minutes gone on the clock. All of a sudden the bubble bursts and the realization of the situation hits home. 111 years of waiting and only now does the fixture’s blanket of doom burn into little pieces. A tale of two sides. In the green corner you have a side with emphasis on accuracy, low risk, kicking, physicality and aggression. In the black huddle meanwhile there’s a pinpoint focus on skills, expansive play, efficiency, flair and composure. When both strategies are executed to perfection, the All Black’s methods make for much sexier viewing. From a totally Irish perspective though, I couldn’t be happier that it was Joe Schmidt’s men who 100% nailed their plan and progressed to victory in simpler style. Kiwi’s will be bitterly disappointed that their team only hit in and around a 6/10 performance. They made some unforced errors that usually separate them from the pack and their go-to men such as Julian Savea, Aaron Smith and to a degree Beauden Barrett massively under performed. It still wasn’t a disastrous All Black performance by any means and that’s a huge credit to the Irish and in particular Andy Farrell. It was the forced errors that kept Ireland within reach. Defence was imperious and although there were some individual blips that were capitalized on, as a unit it was as if not more accurate than the attacking structures that earned no less than 40 points. A credit to Farrell, who’s stamp was vivid throughout in the rush defence. What does thais mean going forward? 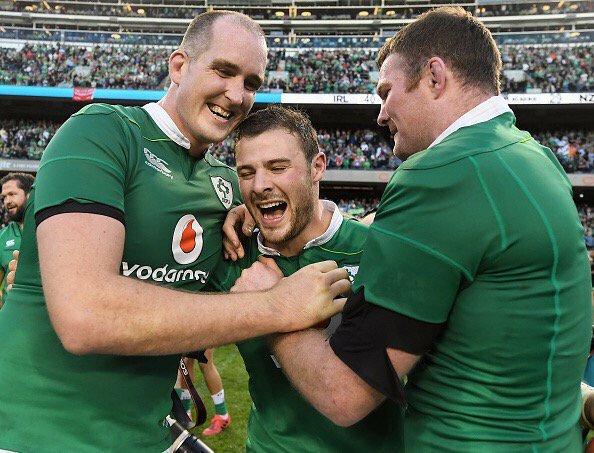 It means that Ireland will have a newfound confidence now that they have broken the mould against the World’s finest but what else? If I’m honest, I’m not convinced that this result suggests that the players of last night are in fact the players who should always start and I don’t think some of them are the guys to take Ireland to a further Six Nations success. Rob Kearney’s selection was much maligned for instance but on the big occasion he stood up as he always does (South Africa 09, Heineken Cup Finals, All Blacks 2013 to name a few examples) but I fear that attacking threat will fade once more on your average match day and defensive fragilities remained an issue in the windy city. A man world-class at his best and cemented hero status by being involved last night, but when Earls is back in the side, Zebo goes to fullback, rivalled by another prospect Tiernan O’Halloran. The New Zealand game was another blockbuster game for the senior members but I have always feared progression under Schmidt. Rory Best, Donnacha Ryan, Jamie Heaslip, Johnny Sexton, Andrew Trimble and Rob Kearney can now, even if they don’t see the next World Cup, walk into the sun having achieved this feat. Some still have more to offer than others but they would go down in history if their careers abruptly ended tomorrow. The coaching team’s next job is to utilize the younger half of the group’s achievement and pave a new path to glory for the new generation. We’ve broken the mould against the All Blacks, now let’s use that experience to surpass the quarter final hurdle that surely awaits us in 2019.